Ce est une propriété tout à fait unique dans un village de pêche unique. Trois balcons, terrasse sur le toit, et la plage secondaires Palapas tous ajoutent à l'ambiance de ce mexicaine Get Away. Les planchers et les finitions sont tout en marbre et de granit. Le complexe est très privé avec une belle plage juste en face de la propriété. Il est moderne et très bien entretenu. Piscine et bain à remous sont situées directement en face de la propriété. Le village de Puerto Morelos est très petit et dispose de nombreux restaurants uniques et d'excellentes possibilités de shopping et où vous pourrez vous détendre et profiter de la culture, le climat, tous à distance de marche de la copropriété ..
Chaque chambre dispose d'une douche et salle de bains privée et spacieuse. Il ya un demi-bain supplémentaire dans le salon de la copropriété. Beautiful condo right on the ocean with gorgeous well maintained grounds and a great pool. Close walk to all the restaurants and shops. Would highly recommend this place. 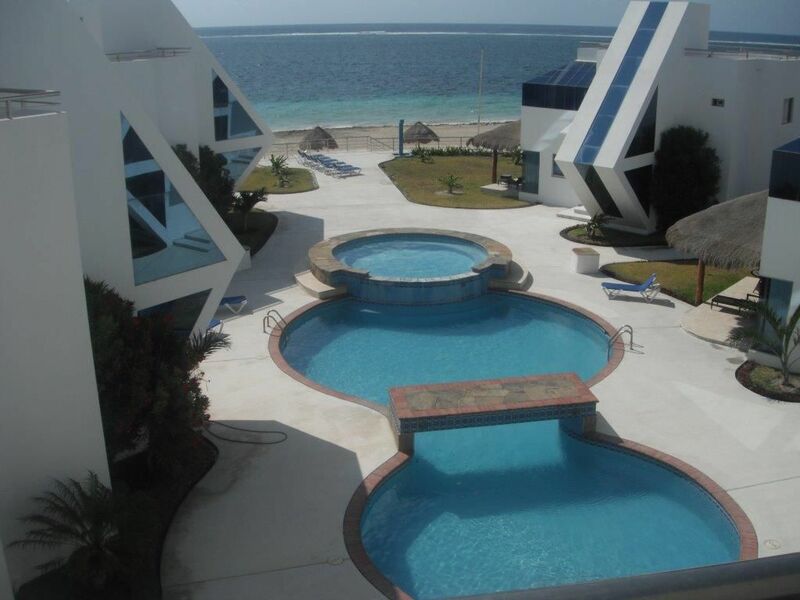 We love Puerto Morelos and we loved the ocean homes condo. So do we!!!!! So glad you enjoyed your stay! Stayed in Anne’s place from October 6th to 20th. We were 2 couples sharing the condo and had a great time. Puerto Morelos is a great little town. We love it there and are definitely going back. The condo is perfectly divided and very spacious. The entire complex needs some tlc, but that did not take anything away from our wonderful vacation. The beach in front of the condo is beautiful. There was a little seaweed issue for a couple of days, but it was being cleaned up. Anne was wonderful to deal with and quickly replied to any inquiries. Ramon who manages the place and his employees were always helpful and gave us great service and were always friendly and took the time to answer any questions. Looking forward to our next visit ! We recently stayed in the ocean homes condo. We had a good time however there was a huge seaweed problem which we were completely unaware of before arriving. I realize this is out of everyone’s control but it really was quite bad. It smelled horrible and made swimming or wading in the ocean very unappealing.They tried to clean it up but there were enormous piles on the beach at all times. Two members of our party actually got bronchitis from breathing in the fumes. As far as the condo itself it could use some updating. As a matter of fact it appeared like most of the complex was undergoing remodeling while we were there. It appeared like the condo had not been cleaned deeply in quite some time. We actually dusted and cleaned the kitchen counters ourselves. We had trouble getting extra water during our stay. We had to wait over 24 hours to receive our 2nd bottle and had to contact the owner instead of the groundskeeper to get it due to no response from him. We have stayed with many vrbo properties and truly prefer vacation homes to hotels. It really gives you more of a chance to see the local community and experience what the area is really like. In that sense we did get that at this property. The location is awesome and we were able to walk to lots of great restaurants along the beach. The pool was very nice and we had it all to ourselves for several days. It would have been nice to have been warned about the seaweed problem or at least given a discount due to the less desirable conditions. We felt like all the other issues would have been easy to overlook had the beaches been like what we expected. I found Anne extremely helpful and professional when dealing booking and questions throughout our stay! great place to stay.10 minute walk on beach or street to town centre. unit in very good shape ,all appliances are high end.beds are comfortable and bathrooms are good size.high ceilings were very nice.would stay here again. Our family came down over Spring Break and had a blast! The property is beautiful, the residence is immaculate, and the weather was amazing! Very private feel and felt safe throughout our entire stay. We have 3 young boys and they thoroughly enjoyed the pool and beach area snorkeling and throwing the baseball on the beach all week! My wife and I enjoyed the quiet days by the pool laying out and evenings at all of the local restaurants, especially Unico beach which is right out front of the complex on the beach. Ramon, who lives on site was very helpful and takes great care of the property. Overall great atmosphere and a ton of fun! I highly recommend visiting this beautiful piece of paradise, I know my family and I are already looking forward to coming back again soon!!! We do give discounts for extended stays. We add $20 cleaning fee for stays over one week. Holiday bookings are at $1450/week. Prices listed are for 4 guests. Additional costs apply for more than 4 guests.